To bring a greater awareness of the poor in our world, we are challenged to live in solidarity with the poor this week. 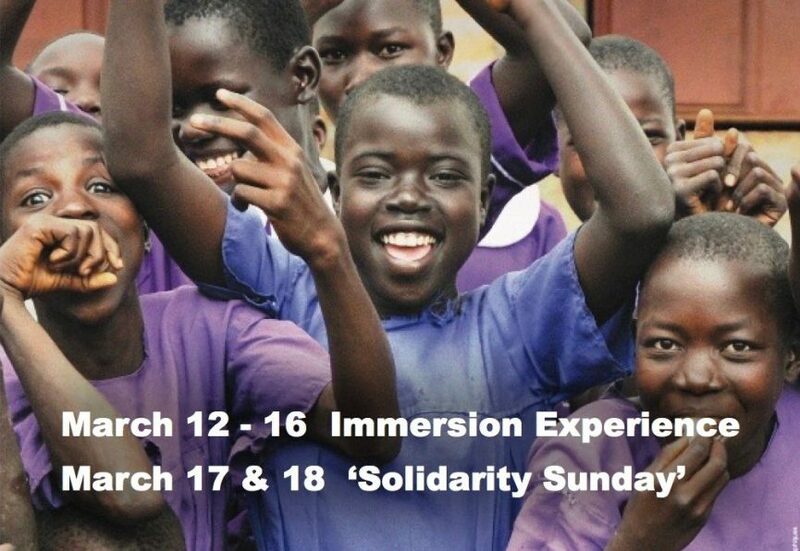 Solidarity Cards were available last Sunday with several options to live a 5-day immersion experience of a challenge that may face our poor everyday. At the end of the week, please bring your card back to the liturgy on ‘Solidarity Sunday’, March 17 & 18 with a reflection of your experience completed on the back of the card. 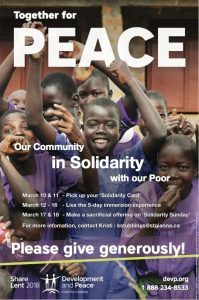 We will participate in a sacrifical offering collection in support of Development & Peace initiatives that will help our sisters and brothers in need around the world. Not to eat meat, poultry, fish or shellfish. I will limit myself to simple meals. Meat, bread, fresh fruits, fresh vegetables, yogurt, cheese, eggs, milk, juice and beverages are expensive. Being mindful of this, I will use more non-perishable food items, similar to that provided by my local food bank, such as: canned fruits and vegetables; canned stew, chili, and brown beans; peanut butter, pasta, rice, canned spaghetti sauce, cereal, and canned soup in the preparation of my meals. In Manitoba 61,914 people used a food bank in March 2016. Meat and fresh produce are simply not within easy reach when you are just getting by. Rely solely on public transportation (bus), walking and cycling to carry out my activities. People working full time earning minimum wage in Manitoba make just over $16,575 (before tax) annually. It costs over $7,000 annually to rent a two bedroom apartment. It takes much creativity, and sacrifice, to pay for everything else on what is left over: food, transportation, clothing, heating, phone, childcare, medications and dental care to name a few. Not spend more than a total of $3.96 daily on what I eat. The daily food allowance for someone on welfare in Manitoba is $3.96. “Take a break” from recreation and paid entertainment. I will not eat at restaurants, attend concerts, movies, or sporting events. Poverty limits an individual’s choices. In other words, poverty doesn’t take a vacation. Increases in hydro, bus, food costs, etc. can have a big impact.